Konica Minolta has launched a new range of office and production printers. The company has launched the bizhub 165e/185e, bizhub 206/226, bizhub 227/287/367, bizhub C227, and bizhub C368/C308/C258 series of colour and monochrome printers. Konica says that its new bizhub models are ideal for small-to-medium business environments. Adding to its existing product lines, Konica Minolta, renowned for its world-leading digital printing technology today announced the launch of bizhub 165e/185e, bizhub 206/226, bizhub 227/287/367, bizhub C227, bizhub C368 / C308/ C258 series of color & monochrome Multi-functional products (MFP-print, copy, scan and fax all in one system). Adopting Konica Minolta's award-winning INFO-Palette design for multi-touch functionality, these latest MFPs include a variety of new features to increase productivity, overall versatility and energy savings. Konica Minolta's newest bizhub models are most ideal for small- to medium-sized business environments and offer productivity to match user workflow. The bizhub series features compact & light weight with powerful functions packed into 3-in-1 design that allows simple operability through one touch buttons. With its cutting edge technology Konica Minolta’s bizhub series enables printing from anywhere, anytime with the most advanced wireless, mobile and cloud computing. Approximately 51% of MFP main body are made by recycled materials- PC/ABS and biomass plastic. Hence, the bizhub series are always the top priority in environmental contribution. To protect valuable information, this series also incorporates advanced security features like authentication on the MFP main unit, IC card authentication, biometric authentication, TPM (Trusted Platform Module) etc. Furthermore, the series offers Konica Minolta's exclusive Emperon® print system for built-in print control and the next-generation Simitri® HD toner formulation for sharp, clear images. Speaking on the occasion, Mr. Yuji Nakata, MD, Konica Minolta Business Solutions Pvt Ltd said “Carrying the legacy of smart printing technology forward, in today's competitive business world Konica Minolta inducts ‘A Breath of Fresh Air’ to their existing line of MFP and production printers. For competitive business world, MFPs and production printers are now part of packaged solution that facilitates value added services, in terms of efficiency, effectiveness, improved and optimization”. “Keeping the company’s vision in mind, Konica Minolta is relentlessly working towards specific eco- friendly technology. 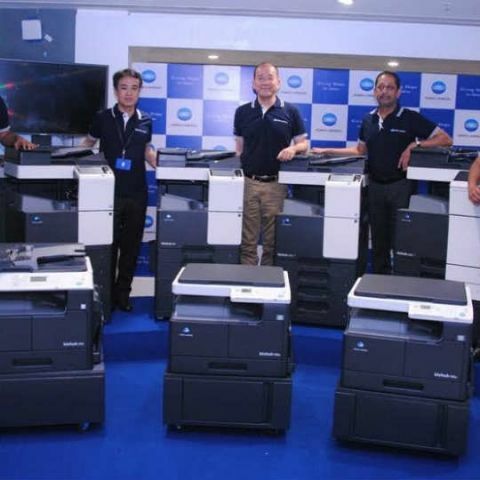 As an enhanced series of MFPs and production printers, the bizhub series exemplify how customers can count on Konica Minolta for solutions that allow them to manage information faster and more efficiently with less impact to the environment." said Mr. Balakrishnan, Executive General Manager (EGM), Konica Minolta Business Solutions Pvt Ltd.